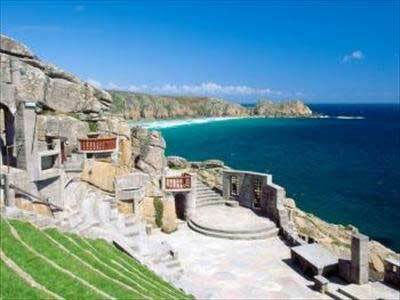 Perched high above on the cliff edge, overlooking the sea is the magnificent amphitheatre of the Minack Theatre. 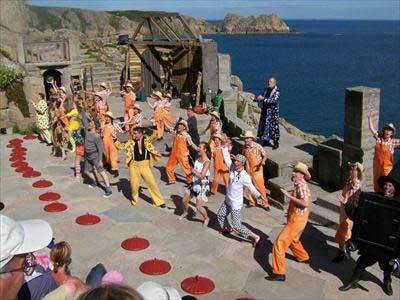 Miss Dorothy Cade carved this amazing theatre from the rocks in the 1930’s with just a handful of assistants. 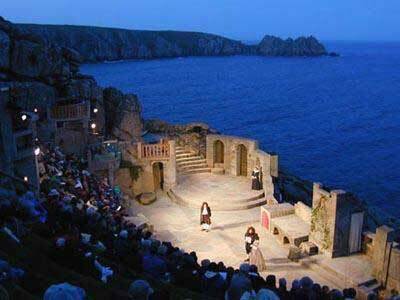 It was constructed at the bottom of Miss Cade’s cliff top garden and originally was only small as it was built to host a village production of A Midsummer Night’s Dream. It was then expanded, and now it could rival any Roman amphitheatre, and present day productions include Shakespeare, ballet, contemporary plays and musicals. Take along a picnic and a bottle of wine, and on a warm summers evening you can look beyond the action on stage towards the sea and the setting sun and when the action on stage heats up, watch the sea and sky respond with their own spectacular pattern of clouds, foaming waves and brilliant sunsets – once you have witnessed this spectacular visage and atmosphere, you will agree, there is not a theatre in Broadway or the West End to rival this….